The first time I tested out a full face snorkel mask while on vacation in Panama, I was blown away! Breathing was easy and comfortable; my vision was unobstructed, and I could actually open my mouth and relax my sore jaw. Since they were introduced to the market in 2014, full face snorkel masks of varying quality have been popping up all over the place. 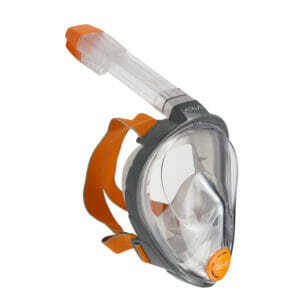 It’s important to purchase a high-quality full face mask with a good reputation, as low-quality models may fog up, leak water or scratch easily. 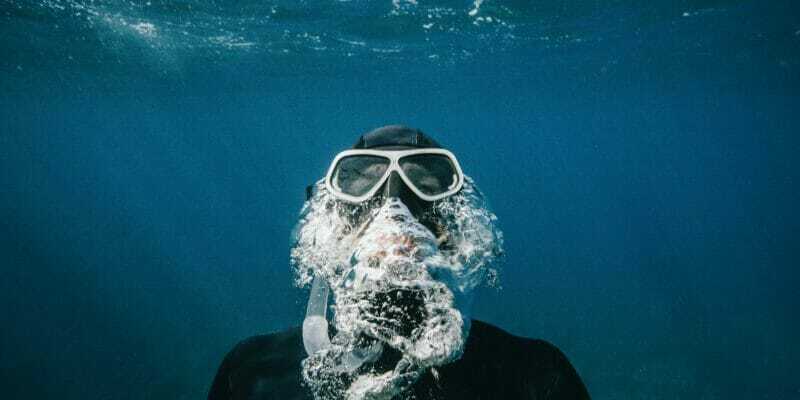 Is a full face snorkel mask right for you? How Do Full Face Snorkel Masks Work? How to pick the right full face snorkel mask? So should you buy a full face snorkel mask? It depends on what you are looking for in a snorkel mask. Traditional snorkel masks have their limitations and full face snorkels can be a great alternative or addition to your snorkel gear. Visibility. There’s nothing better if great visibility is what you’re after. Full 180-degree panoramic visibility is one of the best features of these snorkels. 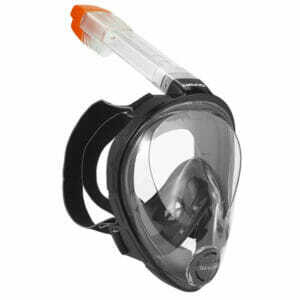 Traditional snorkels have a limited field of vision and prevent you from using your peripheral vision while underwater. Also, unlike traditional snorkels, these tend to fog up much less, which means you will save time defogging and cleaning the lens. Ease of Use. Another key feature of the full face snorkel is how easy it is to use. Because you can breathe naturally, no learning curve is necessary. You can breathe through your nose or your mouth as you normally would above the water. No more swallowing salt water or tired jaw from biting onto a mouthpiece! Waterproof Seal. The watertight rubber seal which surrounds your face is usually better than with traditional snorkel masks. Also if you sport a mustache, you can still get a perfect seal with one of these masks, which would be near impossible with a regular mask. 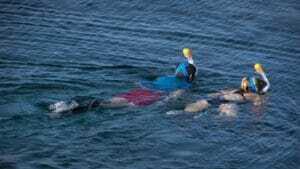 Freediving. Full face masks are not ideal if you do a lot of freediving. Because of the amount of air that is contained inside the mask, the pressure inside the mask can become an issue when diving too deep. Also, due to the one-piece design of the mask, equalizing the pressure in your ears is not possible as you would with a standard mask by holding your nose and blowing air into your ears. Size. 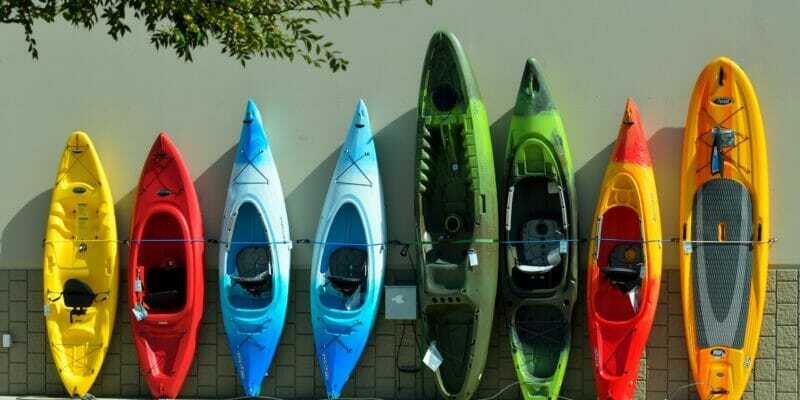 The design is bulkier than your typical snorkel and takes up more space in your luggage or bag. So if space is at a premium, consider a regular snorkel. The one-piece design is quite an impressive engineering achievement. The mask is divided into two sections, a breathing section which covers the nose and mouth, and a viewing section for the eyes and upper face. The two sections are divided by a silicone skirt with one-way valves which allow air to flow into the breathing section, but not back out into the viewing section. This prevents fogging and condensation buildup, which normal snorkel masks often suffer from. Most one-piece masks also have a dry top snorkel incorporated in them. This prevents any water from getting into the snorkel and ensures you don’t accidentally swallow any water. The dry top system has a floating ball inside the snorkel itself. When the snorkel is above the water, the snorkel valve remains open and you can breathe normally. When you descend below the water, the ball blocks the snorkel valve and no water or air will enter the mask until you come back up. Many regular snorkels also have these dry top valves incorporated in them as well. The mask that started it all! Tribord was the first company to develop a full face snorkel mask back in 2014. The Tribord Subea EasyBreath is the updated 2018 model of their award-winning original design. People love the simplicity and solid design of these masks. The lens is constructed of a tough impact-resistant and shatterproof polycarbonate. 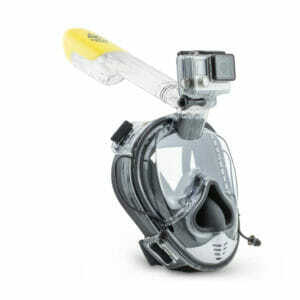 It comes with a dry top snorkel to prevent any water from seeping into the mask. A unique feature is the highly visible orange top of the snorkel. This is a great safety feature; it greatly increases the visibility of the snorkeler to nearby boats and others in the area. The mask comes in four sizes (X-Small, S/M, M/L, L/XL) and three different colors, so it’s ideal for children and adults. The Ocean Reef Aria is another great mask from a reputable brand which has been in the diving and scuba business for many years. 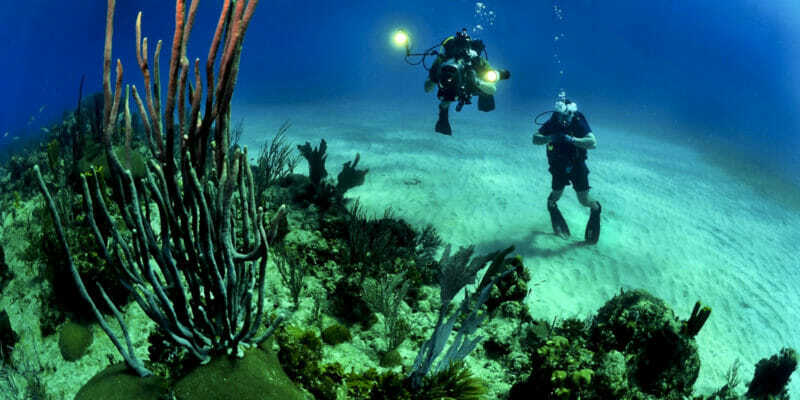 They manufacture advanced diving equipment, so you can be sure you are getting a quality product. This mask is durable, comfortable and a joy to use! The silicone skirt which seals the mask is extremely comfortable and one of the best on the market. This allows you to use the mask for hours at a time without your face or jaw getting sore. The seal doesn’t allow any water to get in the mask, and the anti-fog system is excellent. The dry snorkel system is also superior. It uses a plastic ball bearing to instantly block the snorkel when you dive below the water. This prevents any water from leaking in. Cheaper models have been known to stick sometimes and allow water into the mask. This mask also has some really useful accessories. Optional GoPro camera mount, built in walkie-talkie system and an optical lenses support can all be purchased. The Aria comes in a variety of sizes and color combinations, from Extra Small to Large/Extra Large. The new and improved Seabeast AF90 is an excellent choice and is truly an outstanding full face snorkel mask. The Seabeast features a unique hydrophilic anti-fog coating on the lens which actually absorbs excess water droplets to give you a totally fog-free view. The coating creates a polymer bond with the lens which means it will last as long as the mask does and won’t wear off. The dry top snorkel is made extremely well, and won’t allow any water into the snorkel if you dive below the water. The snorkel top actually folds down into the mask when you need to store it away. This makes it great for traveling and you won’t ever misplace the snorkel top! A GoPro camera mount also comes included, so you can use it for taking pictures and video right out of the box. The Seabeast comes in 2 sizes, Small/Medium or Large/Extra Large. This Ninja Shark mask is on the cutting edge of full face snorkel masks. 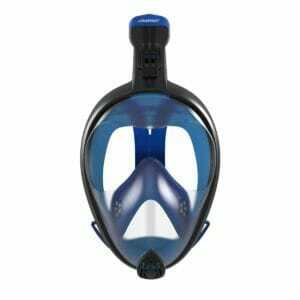 It solves two major issues that people have with full face snorkel masks. Firstly, the mask allows you to pinch your nose and equalize when diving down below the surface. This gives you the ability to dive down and take a look at things like a normal snorkel, while still having all the advantages of a full face mask. Secondly, it features a one size fits all silicone gasbag design that will fit all sized faces, from adults to children ages 12 and up. The design is slightly different from other full face snorkels. In the middle of the plastic lens, a nose shaped silicone insert allows you to pinch and apply pressure into your ears. You can dive down as deep as you normally could without any pain in the eardrums. The gasbag seal design is a large soft and flexible piece of silicone that can form a seal on a variety of face sizes and shapes. This makes it very versatile; you can share it with your friends and not worry about the wrong fit! The anti-fog system is great. The lens is coated in an anti-fog barrier, and the mask has an additional breathing chamber to increase ventilation and prevent any fogging. Breathing is outstanding in this mask. The snorkel tube sits at just the right angle for optimal breathing, and the additional breathing chamber means you get more air coming in than with other masks. The Ninja Shark is available in three colors (Black, Blue and Pink). It comes with an included GoPro camera mount. 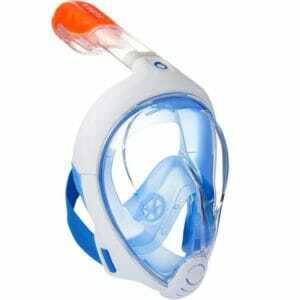 The Mares Head Sea Vu Dry is a great full face snorkel mask from a trusted brand. 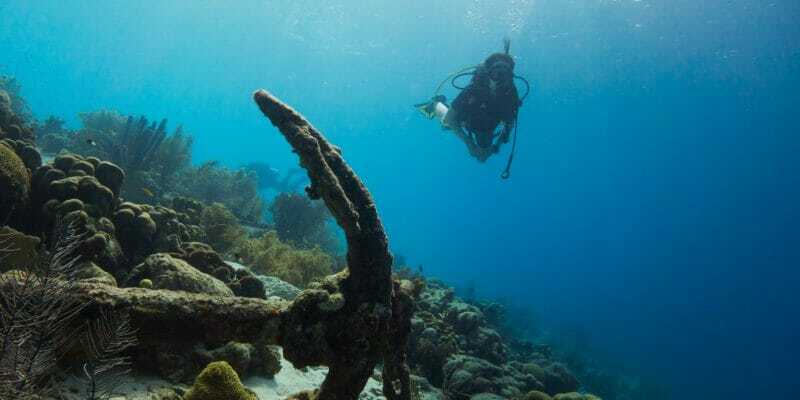 Head/Mares have been manufacturing some of the best diving and scuba gear for many years. They are one of the few companies that have tested their mask for C02 buildup, to ensure it’s completely safe for use. This mask is simple but very well built. The build materials are of excellent quality. 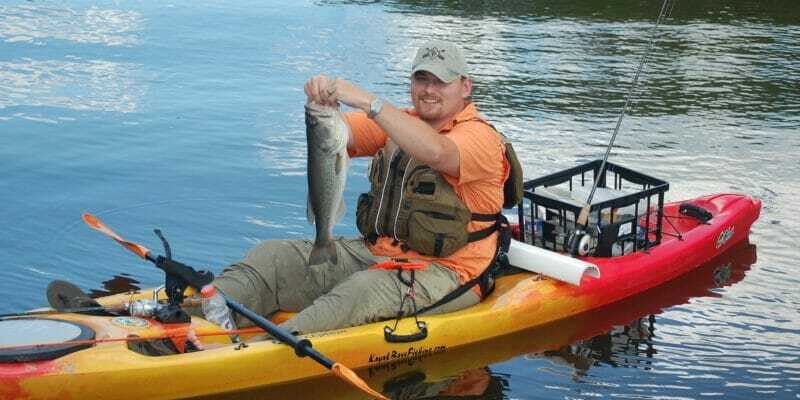 The hard shatter-proof polycarbonate lens provides great visibility, while the soft silicone skirt gives you a comfortable waterproof seal from the water. The dry top snorkel is colored bright orange, so it’s great for safety, and increases your visibility to other boats in the area. The mask comes in a variety of sizes and colors, so the right fit and style should be easy to find. Now that we have reviewed some of the best masks out there, how should you decide on the best one for you? 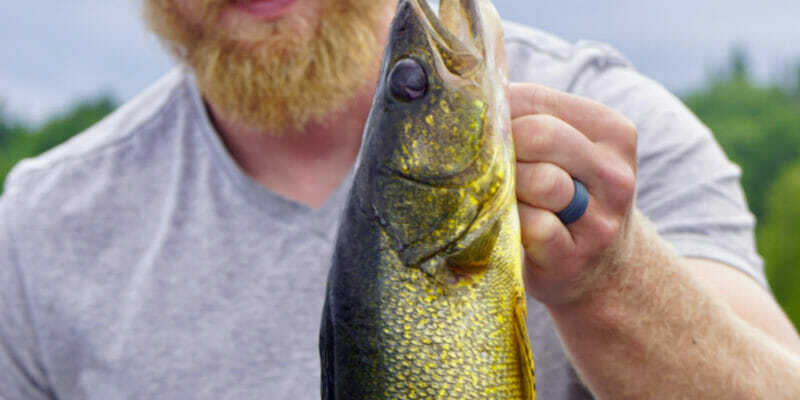 Flat Lens vs. Curved Lens: All off the full face snorkel masks in this review feature a flat lens. This design is superior to the curved lens design which distorts your view and can cause disorientation. Pick a model with a flat lens. Fit: Fit is extremely important when buying a mask. If the mask fits poorly, water will leak in, and you will be constantly clearing the mask of water. In order to determine the right size mask, measure the distance from the top of your nose down to your chin. Most masks have a sizing guide which will tell you the right size to buy. If possible you should try the mask on before buying to make sure the fit is right. Definitely try it on and test it out locally before you take it with you on a trip. Anti-Fog: Most full face snorkels have some form of anti-fog coating. Look for one with a good anti-fog coating. Skirt: The waterproof skirt is one of the most important components of the mask to consider. This is where your face makes contact with the mask. Having a comfortable skirt is important so you can use the mask for hours without discomfort or pain. Silicone is the best material and preferable to rubber or plastic. Quality : Buying a good quality full face mask is very important. Poorly made masks are prone to malfunction, leak, fog up, and not properly vent C02. There are a lot of full face snorkel masks on the market and many aren’t great quality. Many Chinese made knockoffs of good designs are sold online, and it can be difficult to tell if you are getting a quality product. Stick with solid brands like the ones reviewed here to avoid buying an inferior product.